Green space has a positive impact on people, society and the environment. But unfortunately the amount of green space in our well populated cities is dwindling. So are green walls the answer to help solve our issue of declining green space? 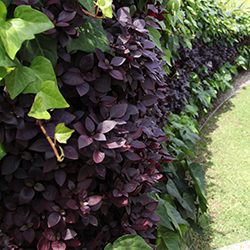 This entry was posted in Alternanthera, Dianella caerulea, Green Wall Plants, green walls, Greenwall Plants, Lawn Care and tagged are green walls green space, choosing green wall plants, colourful green wall plants, create green space with a green wall, green space, Green Wall Plants, green walls, Little Ruby. Bookmark the permalink.